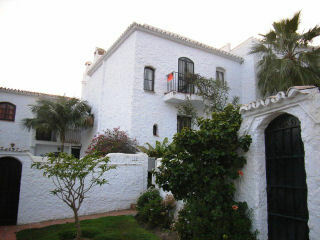 A large two bedroom Villa on the popular Capistrano complex in Nerja. There is a one bedroom apartment underneath and therefore can be rented as a three bedroom Villa. On entry there is a large lounge with dining area and patio doors out to the balcony and garden. Also on this floor there is a fitted kitchen and a cloakroom. Upstairs there is a double master bedroom and a twin bedroom both with fitted wardrobes and both have patio doors leading to a balcony, which in turn had a spiral staircase to a roof terrace. On this floor there is also a full bathroom. The apartment comprises a sitting area with kitchen (although this is not set up to be used separately from the main house), a twin bedroom and a shower room. Capistrano has two swimming pools, small supermarket and a couple of bars, so you can stay on site. The walk into town is a good 20 minutes and about the same to Burriana beach. A car would be advisable but there is a local bus service which runs until late in the summer months. 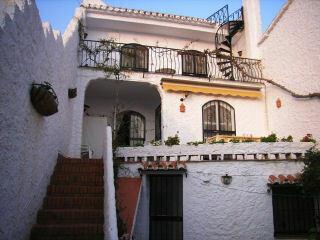 The villa can also be let as a two bedroom. Although, the apartment sleeps 4 people, it is normally possible to put an extra bed in the apartment, if required for a 5th person if a child.